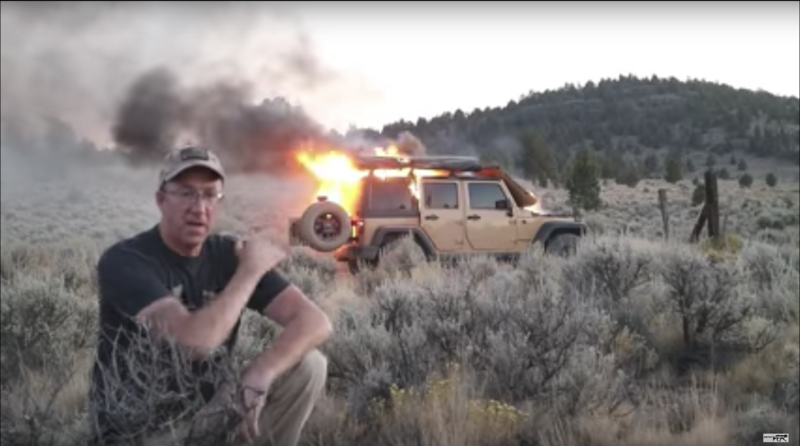 On September 16, an overland YouTube channel called Coyote Works published a video titled Jeep Wrangler Catches Fire & Burns—Overland Car Camping Trip Ends in Disaster. As you can imagine, it generated a bit of a stir. 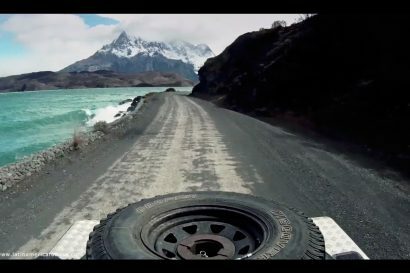 The video begins innocently enough with the owner, Casey Kaiser, on a jaunt through the Oregon desert while describing the area around him. Later in the day, he stops to open a gate, at which time smoke begins to pour out from under the Jeep’s hood. Unfortunately, there is no video of the next few moments, but Casey claims that he used both the fire extinguisher and several jugs of water attempting to put out the flames. Whatever he did, the efforts were unsuccessful, and the flames returned strong as ever. 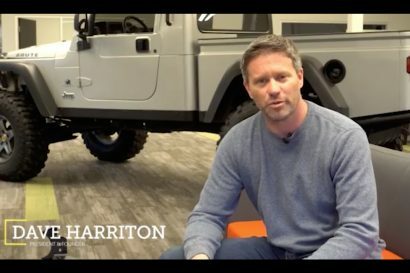 The remainder of the video is somewhere between odd and depressing, as you watch his JK burn to the ground while he calmly talks through the situation like it’s a training video. Although many people have been quick to criticize him, or even claim insurance fraud, we aren’t here to speculate. Instead, we want to take a moment to look at what he did right, what he could have done better, and what we can all learn from the situation. Feel free to watch the video below first, or just skip down to the list of the lessons learned. Stay Calm – The quickest way for an emergency situation to go sideways is panic. Taking a deep breath and a few seconds to think can be the difference between a good decision and a potentially life-threatening one, so don’t be rash. Consider the entire situation based on the time you have and then act, much like Casey did in this video. Carry a Fire Extinguisher and Medical Kit– Accidents happen, and it’s vital to keep a fire extinguisher (appropriate to the size of the vehicle and fuel load) and medical kit close by in an easy to access spot. Additionally, use an automotive model extinguisher when possible, as they are designed to deal with the chemicals and fluids used in vehicles. Casey did a great job of having a fire extinguisher on hand when he needed it most, although we aren’t sure if it was intended specifically for vehicles, a factor that could have played a role in his Jeep’s demise. Keep Your Own Safety Top of Mind – It’s easy to become overly focused on solving the emergency itself, but you need to be continuously re-evaluating the situation with your own safety in mind. 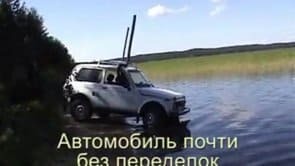 When Casey failed to put out the fire for a second time, he had the forethought to change tactics from saving the vehicle to saving himself. Instead of dumping his remaining water on the flames, he saved it for drinking while pulling out other gear and food necessary for survival. Should he have been forced to remain there, he could have had supplies for several days. Have a Bug-out Bag – At the risk of sounding like preppers, we highly recommend keeping a bug-out bag in your vehicle. This would contain water, food, medical supplies, shelter, insulative clothing layers, and several forms of emergency communications (satellite and ham). Casey had all the supplies he needed in the Jeep, but if he had only been granted moments to grab something instead of minutes, he could have been in big trouble. Carry Emergency Comms – We always encourage people to carry an emergency satellite phone and/or messaging device with them. If Casey hadn’t been lucky enough to find a cellular signal, a SPOT device or inReach would have allowed him to send a distress message to first responders or would have been able to simply message his loved ones to tell them he needed a ride. Pay Attention to Your Environment – Emergency situations are always changing. A threat may dissipate allowing you to take a less risky course of action, or it may worsen forcing you to abandon your efforts or change your strategy. Although his Jeep was burning, and he still had no idea how he would get home, Casey had the presence of mind to watch the flames spreading to surrounding brush. He was able to create a fire line before it became a forest fire that would not only threaten the land but his life. Always Tell Someone Where You Are Going and When You Will Return – This is one of the oldest rules in the book when it comes to remote travel. If no one knows where you are, or when you’ll be back, you likely won’t be missed until it is too late. Make sure someone is waiting to hear from you, and they know where to start looking should you not return. What is Hot Stamped Boron Steel?